The University of Delhi hosted its first public lecture of 2011 today, on ‘The Politics of Nature: East- West Perspective in the Viceregal Lodge of the University. The event was marked by the presence of Vice-Chancellor Prof. Dinesh Singh and Director of the Centre for Science and Environment (CSE) Dr. Sunita Narain. The Pro Vice-Chancellor, Prof. Vivek Suneja, was also present on the occasion which witnessed participation of scholars and professors from DU and JNU and from other social science research facilities as well. The key speaker of the lecture was Prof. Bruno Latour, Professor at the Institut d’études politiques de Paris, France. Prof. Latour is a renowned French sociologist and anthropologist and an influential theorist in the field of Science and Technology Studies. Not only has he worked in philosophy, history, sociology and anthropology of science, he has also contributed significantly to several studies in science policy and research management. 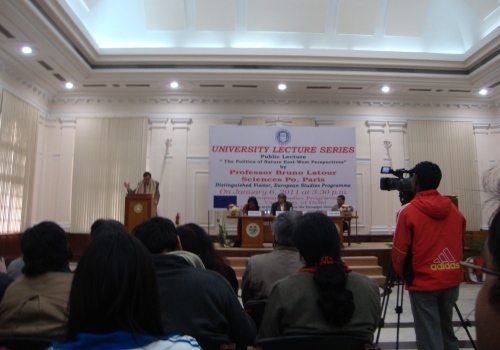 The lecture was opened by the welcome ceremony of Prof. Bruno Latour by Prof. Dinesh Singh. Prof. Singh addressed the audience and talked about the role of science in impacting the society. A Mathematician amidst the social scientists, Prof. Singh kept his words few and spoke about the stature of Prof. Latour before inviting him to deliver the speech of the day. However, the Vice-Chancellor did note that studies of how science has been impacting modern society like the one carried out by Prof. Bruno are wanting in the country. Prof. Bruno began his speech by noting how tiger conservation, dam constructions, GMO, alternative energy have all become the hot topic. He elaborated on how if nature had not been a part of reality but a constitutional arrangement to make political life impossible, then what would politics be without nature! While dealing with this query it becomes obvious that the various green movements are not modifying the modernist project but giving it, on the contrary, a new lease on life. To get out of this limitation, new institutions have to be devised – by following what the ecological crisis is showing already in practice – that allows for scientific facts to be elaborated through due process. Prof. Bruno emphasized upon the fact that it’s time one should come “down to Earth”. The shift in the approach–from matter of fact to the matter of concern–is required in the current situation. Prof. Bruno drew attention towards the reinvention of the paradigm of growth and explained how this should be given prime importance. His speech was followed by Dr. Sunita Narain discussing India’s stand today and where we need to head. In the modern world, people who handle affairs of ecological crisis are unprepared. The approach needs to be changed from a consumption oriented world to a more sustainable one. Among defining the situation and her stand, Dr. Narain explained how the approach of to do much more with much less should be practiced in the current status of crisis. The lecture got many thinking while giving many others new thoughts and ways of looking at the politics of nature. Prof. Vivek Suneja, while giving the vote of thanks shared how the lecture was a stimulus to think about nature and its political aspect. PrevGreen Lens: Jairam Ramesh Lays the Strong Foundation!